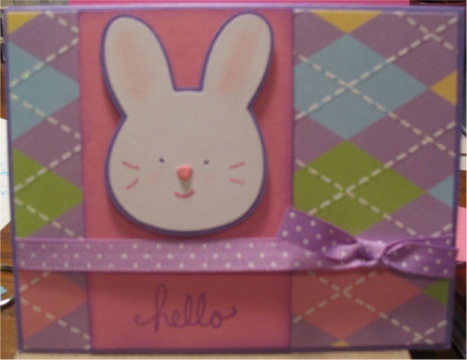 I made this card using the bunny from Doodlecharms. I just think he's so cute! I didn't have a good Happy Easter stamp before I made this (now I do) so I just used a Hello stamp (again). I cut a purple shadow for the bunny, chalked the ears, used marker on the whiskers & mouth and stickled his pink cut out nose. The paper was from DCWV, I think. Well, I had such good intentions to post a little more regularly. I don't know what I was thinking since it's soccer season! I won the Mother's Day Seasonal cartridge from Jenn at http://http://www.jennsscrapbooknook.com/ She has a wonderful blog and where I learned about the Posh Box (the company that did my blog makeover). So I hope to play with that and post some things from that. I also have the Paisley cartrige on the way from Custom Crops. I can't wait to play with it!! 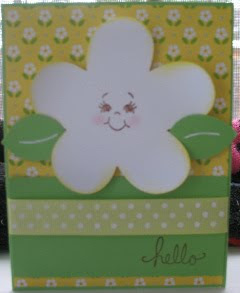 I did make 2 scrapbook pages this week and need to get some decent pictures before I can post those. But, it's a busy week and I just won some advance tickets to see The Last Song on Thursday night. I'll have to post and let you all know how it is! Hope to post some creations soon!! 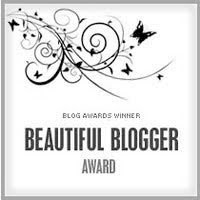 I feel so honored to have received the Beautiful Blog award from Cyndi at Cyndi's Craft Corner. http://cyndiscraftcorner.blogspot.com/ The rules are to post 7 things about myself and pass this on 15 people. 2. I love to play games, video or board. 3. I grew up in PA and followed my boyfriend (now husband) down to GA after graduation. 4. I LOVE to read--am always running out of books to read. 5. I think I have tried just about any craft you can think of! 7. I am a soccer mom! Well, that's 10 people--I was trying to find people that didn't get the award yet and so many do! Hope to post something crafty tomorrow. I just got the Mother's Day mini from a blog candy in the mail today. This week they gave a sketch, but you also had to use a Peachy Keen Stamp. I used Hello Kitty Greetings for the sun cut on blackout with a shadow at 2 1/2 inches. I then used the Dolly Dumpins to stamp with. I stickled the edges and added a little color to the face. I added some ribbon and a sentiment. 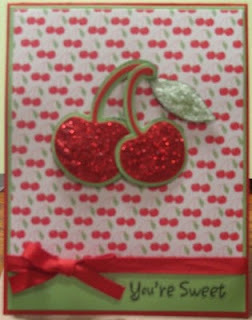 It looked a little plain so I used a small heart stamp and a versamark pad to add to the background. I hope to make some more things today to post through the week. Enjoy your weekend! I used a flower from George with the blackout feature cut at 3 inches. Stamped the face with PK-163 Dolly Dumplins at 1 inch and inked the edges yellow. 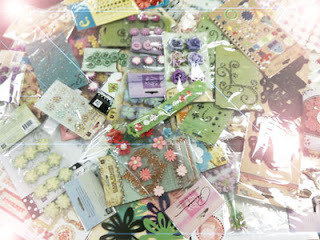 I pop dotted the flower and leaves which came from Doodlecharms. The hello stamp came from a set I can't remember the title of. Finished off with some yellow polka dot ribbon. Prima is giving away two more AMAZING prize packages in conjunction with our BIG SECRET! I was just waiting to use this cute cupcake paper I got from Archivers. I cut the cupcake from Celebrations at 2 1/2 inches. The heart came from another cupcake on the same cart, but I cut it at 4 inches and cut the stem off. I completely stickled the whole cupcake (that took a while to dry!) to match the paper: red, cotton candy and waterfall. I used the sentiment (if you can see it) from Studio G and finished it off with some skittles. Here's a card I made last night. 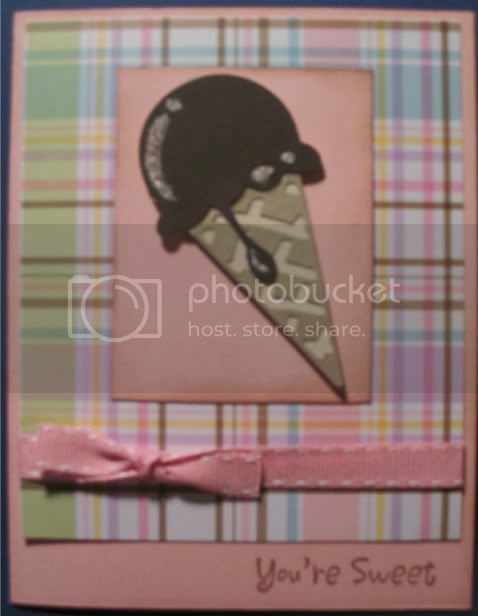 I had to cut out some ice cream shapes for my daughter's science fair project and decided to make a card with one. I used DCWV sweet stack for the patterned paper. The cut came from Indie Art. I cut a blackout, shift blackout, and then the top layers--all at 3 inches. I added Frosted Lace Stickles, some pink ribbon. The You're Sweet is from Studio G.